A hashtag is a textual marker that helps social media users archive their posts by topic, find posts on a topic of their choice, or discover trending topics. Hashtags can be one word, or a phrase. 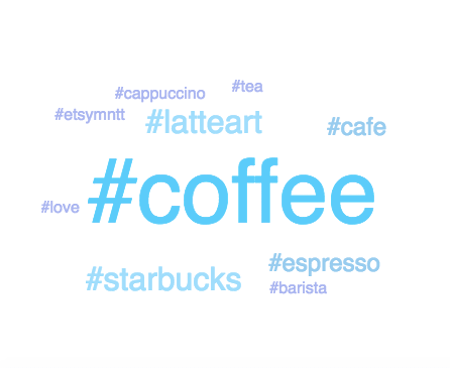 For example, “coffee” could be a hashtag, and so could “latte art.” To create a hashtag, place the pound sign (#) before the word or phrase, and avoid using any spaces or punctuation. So, #coffee and #latteart are the hashtag versions of these words/phrases. There are 85,540,480 posts using #coffee on Instagram. A single #coffee Twitter post was retweeted 1,100 times. A hashtag automatically becomes a clickable link when posted. Anyone who clicks on it is brought to a page that features a feed of all the most recent posts that contain the hashtag. Originally, hashtags were for ease of searching and categorizing posts. But, as with all great inventions, they have evolved from their original intention to coordinate communications, promotion, and events, to spread breaking news, and to follow the progress of television shows. In the left sidebar of your home feed on Twitter.com, or in the search tab of the Twitter mobile app, you will see a list of trending topics according to your geographical location, but what is trending is not always what is most relevant for your brand. Note: Instagram features a feed of trending posts, but does not rank hashtags in this way. You must enter a particular hashtag in the search tab to check its popularity. What topics relevant to your industry are being discussed on social media? Use Hashtagify.me to find out. So, you will definitely want to identify which topics are trending in your industry. A great search engine for this is Hashtagify.me, as it shows you the top 10 hashtags related to a particular keyword. What keywords should you target? Say you are in the restaurant industry. You could start by searching the type of restaurant and/or type of cuisine you offer. For example, #diner or #brunch. From #brunch to #bottomlessmimosas, follow what potential customers are talking about on social media, and let them know what type of champagne your restaurant uses in its mimosa! The search results will pull up all recent posts using that hashtag. Pick a few posts to follow, and get in on them! Answer questions, and generally provide valuable information. This will help build your influence, and boost your reputation as an authority in your industry. Portland and LA-based food writer Jen Stevenson, @jenlikestoeat, has 12.5k followers and more than a little insight into the #pdxfood scene. Once you have created a list of the hashtags that your ideal audiences are using and searching, take some time to sit down and brainstorm how to string them together in a way that is uniquely yours. Before you jump in and copy from others, know that YOU are the expert of your particular community and customer base. Do not be afraid to experiment. You can always plug your hashtag into one of the tools above to check its analytics. You know, as well as everyone, that Portland loves itself as much as it loves its coffee. You want to create a hashtag that brings both loves together. Hashtag Generator is here to help! So far, this article has been focused on the use of community hashtags. Community hashtags are those that connect like-minded users around a specific topic. They are a great way to improve the searchability of your posts, gain followers, and grow your online community. However, because they are more general, and do not necessarily have anything to do with your brand, it is important to also utilize branded hashtags. Branded hashtags are those that include your company’s name, tagline, or the name of one of your products or services. They give your existing followers a fun way to share your brand with their friends, and engage them on a deeper level — the key to developing them as clients. If you are running a campaign or contest, having a brand hashtag can help drive participation and engagement. Your product labels, flyers, stickers, or other promotional materials. If you are creating a hashtag of your own, search its popularity in advance. If you use too specific or long a phrase, there is simply no chance anyone will ever use it. Alternatively, if you use too generic a hashtag, everyone will be using it, resulting in your post getting buried under a constant stream of new posts. To keep with the example of coffee, the sweet spot is somewhere between #coffee and #thirdwavecoffeeshopspdx. Search the popularity of spelling variants of your hashtag, and use some (if not all) of those with 100,000+ posts associated with it. For example, #latteartist and latteartgram are popular variants of #latteart, which could attract similar, but different, markets, such as coffee shop customers, baristas, and owners. Add hashtags as a comments instead of including them in the caption. Captions always remain displayed below your post, and with too many ​hashtags added to it, it can look spammy and pull focus away from the actual description. When you post hashtags in a comment, it will become hidden if you receive enough additional comments, and you can also delete the comment later if you choose. If you are running a campaign or contest, having a brand hashtag can help drive participation and engagement. It will also organize all the posts that are tagged with it on a hashtag page. This is helpful if you are using the hashtag to collect entries for a promotion or contest submissions, or looking for content to “re-post” onto your account. Do not make it completely obvious that your hashtag is a marketing initiative. People are hesitant to reuse a brand name or slogan, but are more inclined to participate if you use creative catch phrases. Hashtags are an important part of discovery on social media, allowing brands to gain exposure to specific areas of interest and niche groups. While they may not drive exponential sales growth, they give your ideal audiences an organic way to discover you through the topics that interest them. WordPress 5.0 is launching soon and set to take the WordPress community by a storm. The update includes changes that will be hard for users to get used to, particularly the new WordPress editor, known as Gutenberg, after another invention that revolutionized publishing — Johannes Gutenberg’s “movable type” printing press. They called it Gutenberg for a reason. Note: The WordPress editor is the central workhub for content creation. It provides a basic, but effective, means of entering content into your pages in preparation for publishing or updating an already published page. WordPress wants as much feedback and real-world testing as possible, so they’ve released the Gutenberg editor as a plugin for anyone to try. So far, it has received an average rating of 2.7/5 stars with 165 one star reviews. What happens if you agree with the critical user above, that Gutenberg poses too great a threat to your workflow than it’s worth? Read on for our recommendations. Unfortunately, whether we like it or not, Gutenberg is coming. If, like us, you believe that the best way to prepare for change is to start before it happens, download the Gutenberg plugin for your site, and run through one of the three usability tests yourself. Comparing Gutenberg vs current editor, you will first notice a much cleaner, more uniform editing screen. The Gutenberg editor bears a strong resemblance to Medium. Read more about Medium vs WordPress here. However, WordPress’ stated mission behind the project is “to make building rich web content easier and more intuitive, democratizing publishing — and work — for everyone, regardless of technical ability.” The current WordPress editor hasn’t had many changes over the years, and requires a lot of us to utilize shortcodes and HTML to make things work. Many features of WordPress 5.0, including Gutenberg, are an attempt to make the platform more accessible to and user-friendly for the general user, such as a blogger or small business owner. So, what’s the problem? Isn’t digital equity a good thing? The problem, in short, is that Gutenberg will make sites break. A large number of developers, freelancers and agencies don’t use page builder plugins, but rather a combination of custom fields and meta boxes, to give clients the ability to display their content in a controlled and prescribed style. With WordPress 5.0 installed, the next time they edit a post created in this way, things won’t look right. Additionally, certain plugins may break, such as those used to support custom post types, creating additional work for plugin designers, and/or rendering their work obsolete. So, what to do? Before WordPress 5.0 lands, take the time to backup your website, by downloading all of the files to your local computer or Dropbox, and copy/pasting your web copy into a Word document. If you do so in HTML mode, it will be easier to maintain your custom formatting. As mentioned in the review above, one way to prevent your site from breaking is to enable the Classic Editor plugin now, and configure it to revert to the old editor. We understand your reluctance (trust us – we feel it) to upgrade to the newer version of a software when you are happy with the performance of the previous one. However, WordPress 5.0 will be bringing major security updates and bug fixes, so updating your website to 5.0 is not much of a choice but a necessity. This project has been one of the most beautiful we’ve ever participated. Astrum Care provides consultation and products to caregivers that are engaged in caring for individuals with all types of dementia. The process involved a custom design that was able not only to showcase Astrum’s products, but also to transmit all the knowledge and advising based on more than twenty years of experience. This is only the beginning… Astrum Care is working on a series of training sessions that will provide hope and tools for the caregivers and families to deal with a patient with dementia. We’re thrilled to be part of this process and we’ll keep you posted on that too. This time we’ve skipped this step. Freddy’s Landscape had a website and a new brand Logo that was our start point of this project. The wireframes are created early in the development process to establish the basic structure of the website before visual design and content is added. 2.1.- On Round 1, our wireframe consist in a block diagram (site-map) plus a basic draft or mockup of the home page. 2.2.- On Round 2, After the client approved the outline of the site-map, we defined the styles, fonts and functionality specs. With the plan in place using the site-map and the style/design specs, we can now design the layouts that provide a visual preview to the client about what will be the website of their dreams. By putting hands on the code, the static layouts began to come alive through the internet. Content and beautiful landscape photos were added until get the final results … wonderful! During this final phase of the project we spent some time testing the site, integrating the SEO in-site the code, integrating the Security software, and customizing the basic law compliance documentation. Almost 8 years since I created my 1st website, based on tables (pure HTML). A long journey running after the technology evolution, that has challenged me everyday ever since. Today, TheEvaSite (TES.) is a reality, and I couldn’t be happier to celebrate the recent completion of our 100th project. Camacho Law Offices required a re-vamp of their online presence. We have launched a new Custom WordPress site at ecamlaw.com, and the Spanish version is coming soon. We are committed to provide the ongoing support to warrant the proper performance of the website. TES Launches New Website & will exhibit at the Women’s Expo in Stamford. STAMFORD, Connecticut, March 21, 2016 — Website developer and branding expert TheEvaSite (TES) has launched a new, expanded website showcasing multiple examples of the firm’s successful development, branding and marketing work as well as its expanded Web design and branding services for small and midsize businesses (SMBs). TheEvaSite will present its new Web design and branding packages at the Fairfield County Women’s Expo on April 16-17th at the Crowne Plaza Stamford Hotel in Stamford, Conn. Business owners and entrepreneurs can meet TES’ growing team of professionals, learn about the Web design and branding packages designed to meet SMBs’ needs for support and affordability, and enter to win one of several prizes.